Looking for a fun way to celebrate time with kids and fathers? This Father's Day jumbled letters puzzle engages the brain, consolidates spelling of theme related words and activates problem solving strategies. To solve the puzzle kids and dads can compete to see who can be the first to unscramble the puzzle. 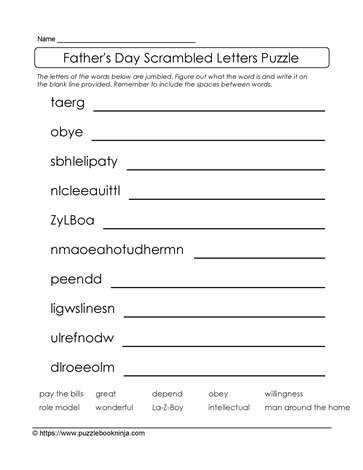 Create an additional challenge by blocking out the word bank at the bottom of the puzzle, and use current knowledge of Father's Day words to solve the puzzle.